It’s been a fair few months since my travels to the motherland Hong Kong. Today was one of the days I could finally share one of the highlights of the trip and that was finally meeting Fluffy House. I first fell I love with the short stories and toys ever since I saw the promotion photo of Fluffy House Mr cloud at 2012 Taiwan toy festival. The mission from then on was to collect them all. A few messages sent to the Fluffy House team and we were all set for a meet up. All in good timing at that time we helped them land a spot at Toycon 2015 and also they broke the news they were ready to launch a cool and exciting project to do with food! When they mentioned that they were doing a collaboration with a cafe we got all excited, bring toys and their branding and turning a cafe into some good eating is a neat idea and winner for both party. Seeing ideas of the project we jumped at the chance to go behind the scenes of the launch of Sogno Cafe+ Fluffy house pop up shop. Sogno cafe+ was already an established catering joint, but being friends with Fluffy House the opportunity came to light and the joint venture was born. So how would it work I hear you say, the very creative chefs at Sogno will incorporate Fluffy House characters in the furnishings ,as well as most of the menu with includes cakes and continental dishes, not forgetting the incredible drinks. Sogno Cafe will also stock the whole range of Fluffy House products. As an exclusive you can pick up some ultra cute china and take a little Fluffy House x Sogno back home. The cafe was filled with Fluffy House goodness. The dishes was mostly cleverly integrated with Fluffy House characters and worked well with each dish and drinks. As you can see Sogno created drinks that represents the characters like the blue/white droplets was matching Mr Cloud and little Raindrop. Fluffy House made some special accessories like this Sogno Fluffy House apron which fits perfectly. Sogno do a nice coffee with a good selection of traditional western deserts but with a slight twist. We even had a chance to see some up coming products while sipping and eating some yummy food. I really liked how this venture turned out with nice classic decor tied in with designer toys. 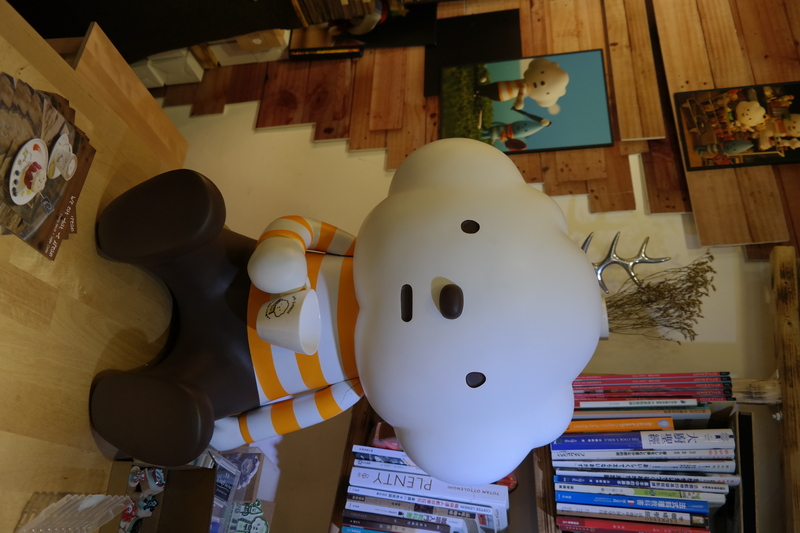 They even made a HUGE Mr cloud where you could have a coffee with him and keep him company. You can visit Fluffy House x Sogno Cafe+ till the end of August as they have extended collaboration. Sogno Cafe+ x Fluffy House Pop up http://www.sognocafeplus.com/ and Facebook Page. If you are looking for Fluffy House to join your collection you can buy them directly from http://fluffyhouse.com/ or Collect and Display.